Utforsk Nice høydepunkter på denne pedicab-turen med kommentarer fra en guide. Det er den perfekte måten å se Nice på en begrenset tid, og det tar stresset ut av å navigere. Du vil besøke de smale gatene i gamlebyen, og få tilgang til steder som ikke kan nås med offentlig transport. Potensielle høydepunkter (avhengig av varighet av tur) inkluderer Justice Palace, Garibaldi Square og Flower Market. Excellent tour. 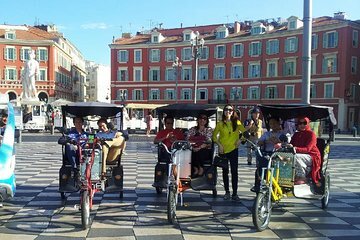 Pedicabs are a great way to see the highlights of Nice and can get down the back alleys that cabs/buses can't do. These particular pedicabs are great on a hot summer day - the open back means air is able to flow straight through. There were 6 of us together and we were able to do the tour together with our excellent guides. Perfect for visitors of all ages our group was aged 11-73. Thank you for a great tour!